Greg Hall, guitar in hand, delights audiences nationwide with his songwriting, singing, and humorous observations of life in America. Based in Nashville, Greg headlines comedy venues around the country. He also has a thirty+ year history of playing music in diners, drive-ins, and dives. 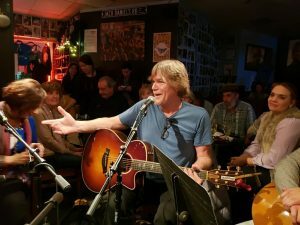 His entertainment career began in Texas as a singer/songwriter after winning a Kennedy Center award for “Outstanding Achievement in Musical Composition.” “In college I wrote the score for a Garcia Lorca play on an old Gibson Blue Ridge 12-string. The guitar won that award. You could play E minor, and sound omnipotent,” he says with a smile.Immediately after, Greg had the confidence to start playing listening rooms. “Texas in the late ’80s was a wonderful school to learn how to be a lone troubadour. I’d go see, and open shows for guys like Ray Wylie Hubbard, Steven Fromholz, Jimmie Dale Gilmore, Shake Russell, Jimmy La Fave, and the like. They were the real deal, and we were ‘Americana’ before the genre had a name.” The next decade took him on a musical journey through thirty states, and Europe. He released five CDs along the way, and shared stages with Shelby Lynne, Vern Gosdin, Jerry Jeff Walker, Eric Johnson, The Fabulous Thunderbirds, Keith Urban, Dan Seals, and others. Then came the car wreck, and the comedy. To read about Greg in The Dallas Morning News, click here. To read about Greg in the Tennessean, click here.